In 2018, Douglas Worthen was given a sabbatical leave to study how musicians signal and communicate to both each other and the audience through physical gesture. In addition, his study focused on German sources of early nineteenth century performance practice and repertoire. As of November, 2018, his online research papers and Youtube videos have been downloaded over twenty thousand times. He has become a regular member of the Kingsbury Baroque Ensemble in St. Louis, and performs with the Altgeld Chamber Players at SIU. He now conducts the Southern Illinois Senior and Junior Flute Choirs. Since joining the SIUC School of Music faculty in 2008, Worthen has given numerous performances and lectures at the National Flute Convention. 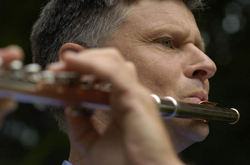 He toured and recorded works by Kaspar Kummer with Red Cedar Chamber Music and performed in Manchester, UK, for the British Flute Society. His recording of works by Joseph Bodin de Boismortier with harpsichordist Ursula Duetschler received critical acclaim in the American Record Guide, Early Music America, and European publications. In May of 2011, Worthen presented concerts in NanNing and GuangXi, China. During the summers of 2011 and 2012, Worthen taught and performed at the Kammermusik chamber music program in Santa Fe, New Mexico.